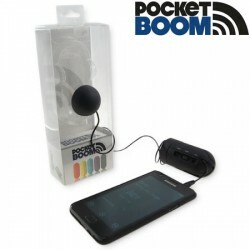 Pocket Boomis an awesome little gadget which turns any surface into a bass pumping speaker. Pocket Boomis a small speaker that you can literally fit in your pocket. The device is a tiny elongated black tube, roughly the size of an adult hand, with a 3.5mm headphone jack on one end and a vibrating satellite speaker on the other. ThePocket Boomtakes 2xAAA batteries but also has a USB power cable which is very handy and runs off any powered USB port. Now I have to admit when we pulled out the Pocket Boomfrom the packaging it looked like a neat device and very simple to use. We saw the 3.5mm headphone jack on one end, a speaker on the other and then just plugged it in. The speaker was ok but very quiet. We then read the instructions and realised the speaker was meant to be stuck to a hollow object (always read the instructions kids) , so we stuck it to the box it came with and all of a sudden the music was coming from the box just as loud as a normal speaker, this was pretty cool. The next two hours of our life was spent sticking to every object we could find, wall, wardrobe, desk, window, dishwasher, wok and the list goes on. Each object sounded different in its own way and we realised this was a great device that could be used anywhere. We found that smooth surface worked best, if the object it was stuck too was too solid it didn’t give as good a sound and metal objects tended to have a slight pinging noise to them, except the dishwasher that sounded great! We have no actual figures for battery life, it has been on for 10 hours and counting and is still going strong. We intended to run the battery dead to provide this information but it just hasn’t run out yet. The casing is robust, we have dropped it a few times and there were no signs of damage. Overall thePocket Boomis a cool little gadget that you will find very useful at the office, around the home and even camping. Although thePocket Boomwont be used for the music at your next party it will provide a good level of sound quality for its size. Its unique capability to stick to any hollow objects and vibrate them to create a decent sound makes it a very useful device to have, and at only £19.99 fromGear Zapit is a great bang for buck gadget. Thanks to Gear Zap for sending us aPocket Boomfor this review.